Halloween may be over and, technically, Tales From the Hood celebrated its twentieth anniversary back in May, but after Nathan Rabin’s recent article “rediscovering” the politically charged anthology horror film and its cult status, I figured it was time to write about one of my favorite horror films. The anthology is my top horror subgenre, but while most cite The Twilight Zone or Tales From the Crypt as their gateway into the portmanteau style of horror, I always go back to Rusty Cundieff’s racially loaded exploration of the supernatural. Now, I realize as a 27-year-old white girl who grew up in the suburbs, that I was never this film’s target demographic. 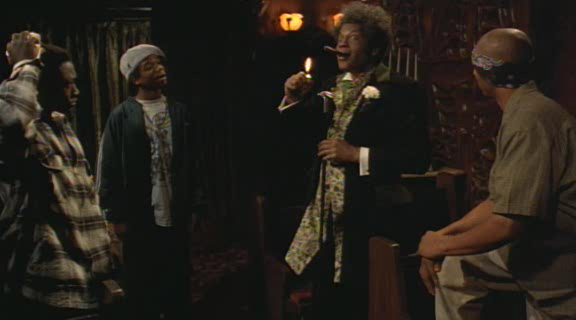 A routine scroll through HBO at the age of eight left me entranced and terrified by images of a devilish Clarence Williams III as a mysterious funeral director telling four tales of the strange and unusual to three drug dealers hiding out inside. Add in a story with a doll – the worst kind of terror you can inflict on a kid – and Tales From the Hood stayed with me throughout my formative years. Even now, as an enlightened adult, it’s amazing (and tragic) how relevant Cundieff’s film remains twenty years later…and it still creeps me out. Keep in mind, Cundieff and co-screenwriter Darin Scott wrote a film that wasn’t just terrifying because it employed dolls, zombies, monsters, and psychological fears, but utilized them as a doorway into talking about issues plaguing the black community at the time, such as domestic violence, police brutality, racism, and gang mentality. As a child, a white child no less, I was scared by the surface level events, never realizing the deeper connotations because I didn’t experience that lifestyle. I’d like to say I saw beneath the race, and saw horror free of racial division since it’s easily understood who you’re meant to sympathize with, but it’s impossible divorcing one from the other. As mentioned above, the film is bookended with Williams, a funeral director, showing three drug dealers various bodies, elaborating on their individual deaths. Since this is an anthology, let’s tackle each story, one by one. “Rouge Cop Revelation:” The first tale involves a novice cop who witness several of his white colleagues murder a prominent black rights activist. Tormented by keeping quite, the young man gets his chance for redemption, compelled by the activist’s spirit. Again, it’s impossible to divorce the events going on in 1995 from this film, and that’s it’s intention. With the Rodney King beating and the L.A. riots only a few years in the past, and the O.J. Simpson trial a few months away, the story of a murdered, unarmed black man by police resonates just as painfully now as it must have then. Like many of the stories in this film, there’s an air of catharsis enveloped within the fantastical. The white cops certainly deserve their comeuppance, but at the same time it’s disheartening realizing that said justice comes through supernatural, and thus impossible, means. The fact we still talk about police brutality makes this story all the more relevant, and while some of the effects haven’t aged well, actors Anthony Griffin and Tom Wright are amazing as the destroyed vigilante and ghostly tormentor, respectively. “Boys Do Get Bruised:” This one and “KKK Comeuppance” are the film’s highlights, maybe because they aren’t crusading for national social justice, but focus on tightly contained stories of individuals; this story also deals with a concept common to every race – domestic violence. A young boy named Walter (Brandon Hammond) suffers from signs of abuse, but maintains a vicious monster is hurting him. His kind teacher (Cundieff playing Hitchcock, or more M. Night Shymalan) tries to help. The domestic violence imagery hear feels all too real, and that alone makes the need for a monster unnecessary. Walter’s metaphorical discussion of a monster, seems to dumb down the concept a bit too much, but once the monster’s revelation is proven, Walter’s fear is more than understandable. I defy anyone to watch David Alan Grier’s work in this film and then watch an episode of In Living Color. As someone who say this before his more comedic work….suffice it so say I never trusted the guy. His performance is incredibly nuanced. His discussion with Cundieff’s Mr. Garvey shows off Grier’s power and menace; he’s a coiled snake just waiting to strike. The equally amazing work from Hammond and Paula Jai Parker as his wife, enhances the charged atmosphere. Just a look from Grier leaves everyone jumping and running to avoid his wrath. are rewarded and justice is served, but it comes through impossible means. Grier’s demise is appropriate and disgusting, but you’re left saddened by how many children don’t have the ability to destroy a picture as a means of escaping their abuse. “KKK Comeuppance:” A white racist politician (Corbin Bernsen) with a shady past including membership in the KKK, gets what’s coming to him when the tortured souls of slaves, captured in dolls, come seeking vengeance. This one seems the most prescient of all. You have a white politician with an obvious antipathy to minorities “speaking his mind?” Sound familiar? Bernsen plays such a sleaze as Duke Metger, and his final moment, covering himself in the American flag, is such a keen image, proof of our government’s inability to adapt and acknowledge our racist past. Dolls are scary! And no doll has ever terrified me more than the ones here. Yes, the effects are dated and there’s an overlap where the dolls aren’t inhabiting the same space; the camera does its best to maintain distance, and rely on the pitter-patter of little feet, or the dolls sitting in corners, as a method of conveying their movement. The rare close-ups or full body shots of the dolls remain creepy, but show the limitations of the effects work. A full-length mural of hoodoo witch, Miss Cobbs, with all the dolls, and their slow progression from the painting into reality remains a frightening bit of terror. “Hard-Core Convert:” A violent gang member and murderer gets one last chance at redemption by undergoing an experimental procedure to reeducate him. Cundieff and Scott obviously watched A Clockwork Orange. The idea of a young man being confronted with violent images as a means of expunging his violent tendencies? You’re expecting someone to start singing “Singin’ in the Rain.” That’s not a slight, because many of these stories have roots in other movies and television shows, and the script tries using the plot device as a means of showing the nature of violence within the black community, the rise of gangs, and how violence begets more violence. The individual confrontations are affecting, but there’s a preachiness here that’s not felt in the previous three, as if Cundieff and Scott want to wrap everything up with a nice bow. The final reveal at the end feels similar to Tales From the Crypt and can be deduced fairly quickly…that’s not to say it isn’t creepy as hell. Don’t underestimate Williams, whose character has been unhinged throughout the entire film and goes full-tilt in the final frames. Do I believe much of my appreciation for Tales From the Hood stems from childhood nostalgia? Probably. However, watching it now proves the adage of being doomed to repeat history. Twenty years later much of Tales From the Hood’s themes remain key issues we have yet to solve. I know I say this as a white woman who found the individual means of terror more horrifying than the messages, but I’ve embraced both elements and believe Tales From the Hood remains a critical piece of horror, and one of the more underseen horror films with a message. The fact that Universal can’t conjure up a single print of this movie for a Blu-ray release (and the DVD is long out of print) shows the film still hasn’t received its due, even in 2015.